How to Mute Conversation Notification on Facebook: When you mute a conversation on Facebook, chat windows will stay closed, and you won't get push notifications on your phone. However, Facebook has a feature called mute conversations that allows you to put a stop to the flood of notifications on Facebook. - Until you turn it back on. 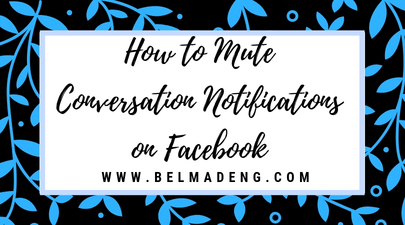 In this post, you'll see how to mute conversation on Facebook and on Messenger for as long as you wish. 1. Navigate to the Group tab, and tap the More menu (3 vertical dots) displayed at the top-right corner of the desired group. 2. Next, choose "Mute Notifications"
3. Note that you can choose to mute notifications for the selected conversation or group for a specific time period (15 minutes, 1 hour, 8 hours, etc.) or until you manually unmute it. Also, if you have an alarm configured on your smartphone, you can choose to mute notifications until the alarm goes off.